You can often find open bars at events, whether they're on a cruise, a resort, or a wedding. Do people really feel an open bar is an occasion for a free-for-all, drink-until-you-drop outing? On the tail of that question, do open bars encourage dangerous behaviors or drinking in excess because you don’t have to pay? We surveyed over 1,000 people who had attended events with open bars in the past year to see how they can tempt people not only to drink more than ordinary but also lower their inhibitions. One study already found that people in the U.S. drink more than ever, but there hasn’t been much focus on the consumption increase at these events. Read on to see how an open bar at a company party or wedding can encourage people to drink excessively. Do Drinking Habits Change at an Open Bar? Our survey revealed that most of those who had access to an open bar tended to drink more (over 53 percent), while less than 43 percent reported they drank about the same. In a tiny percentage of our respondents (4 percent), it was noted they actually drink less when presented with free alcohol. 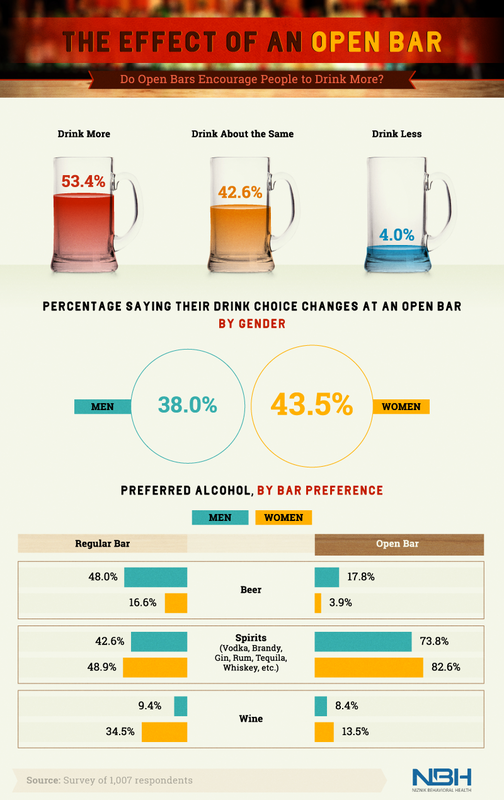 We broke the responses down by alcohol preference as well to see if there were any notable differences when someone was at an open bar versus a regular bar. At a glance, there was a large jump in preference for spirits when someone was at an open bar, and people tended to drink less beer at an open bar than at a regular bar. Spirits, such as vodka, brandy, gin, rum, tequila, and whiskey, tend to have the most alcohol content. Spirits often have 30 to 40 percent alcohol, while beer sits in the single digits. Perhaps those who visit an open bar feel beer doesn’t make sense if they have free liquor and better tasting cocktails at hand. Women were more likely to choose wine as their typical drink when drinking at a regular bar, while men tended to gravitate toward beer. Where Can You Find an Open Bar? So where might one be exposed to an open bar? 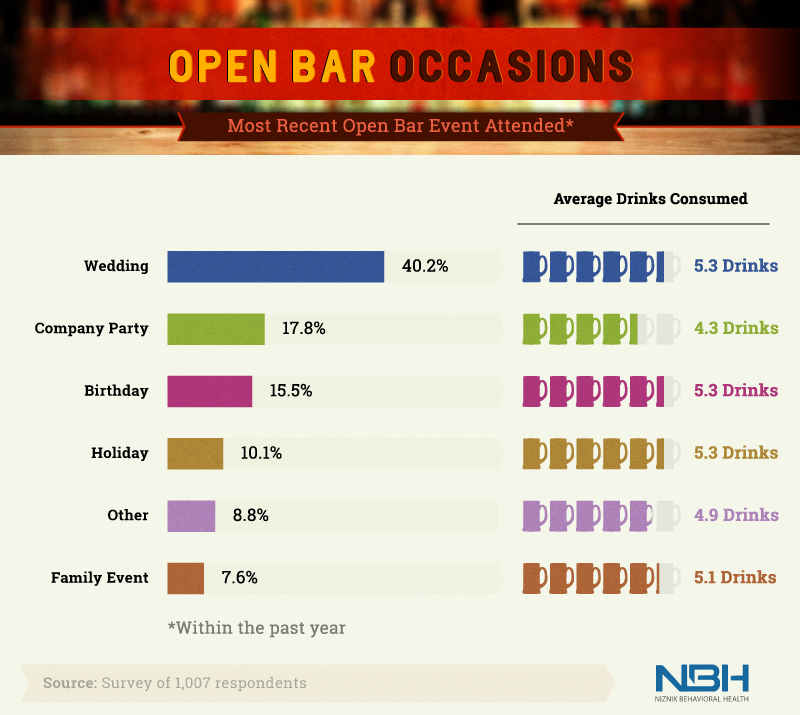 Our respondents cited weddings as the most recent event where they had access to an open bar (around 40 percent). The next occasion where they found an open bar was at company parties (almost 18 percent), followed by birthdays, holiday gatherings, and family events. Most of our respondents reported they consumed just over five drinks on average. The exception was those who had an open bar at a company party, where the average was a little over four drinks. Perhaps this was because they didn’t want to make a bad impression or embarrass themselves in front of their boss. We checked to see how much, on average, our respondents drank when at a regular bar and if that amount increased when they hit an open bar. Unfortunately, open bars did seem to encourage more consumption. At a regular bar, men averaged just under four drinks, while women averaged around three. At an open bar, though, both genders tacked on nearly two additional drinks, with 5.6 drinks for men and 4.6 drinks for women. Those celebrating a wedding, holiday, or family event that had an open bar all drank anywhere from four to six drinks at the cost of around $40, but those celebrating a birthday party went a little over this amount at around $46. Open bars at company parties, though, were slightly less pricey, with an estimated expenditure of over $38. 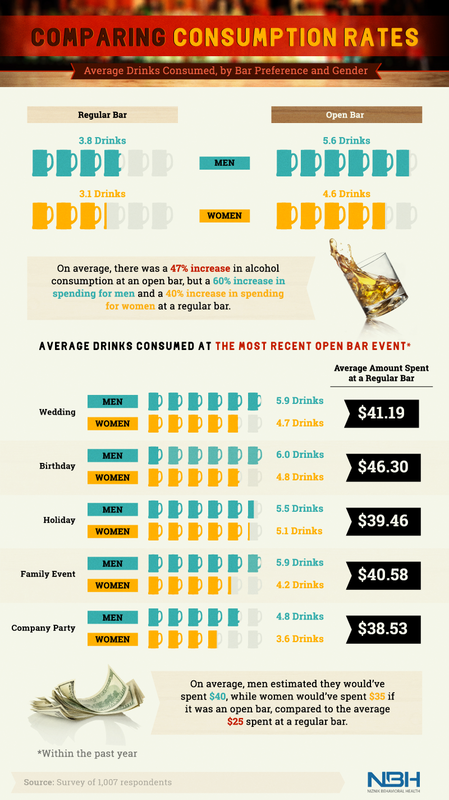 Men and women paid around $25 at a regular bar, but men would have spent around $40 at an open bar, compared to $35 for women. Overall, there was an increase of 47 percent in alcohol consumption at an open bar. 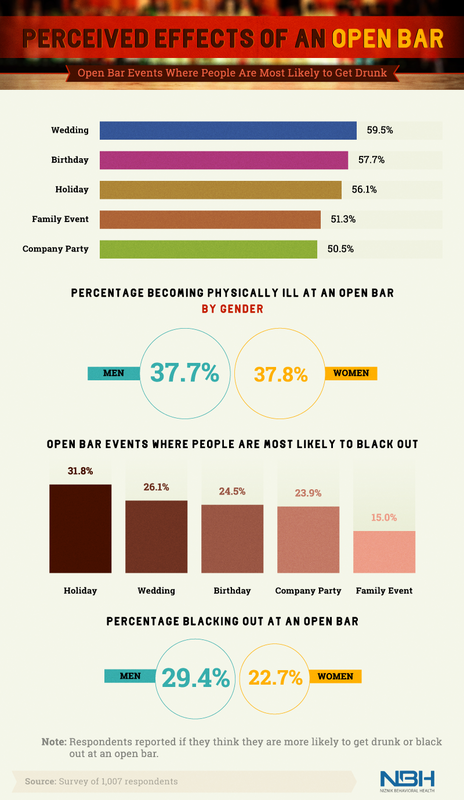 At which events with open bars are people most likely to get drunk? Weddings came out on top here (almost 60 percent), followed by birthdays, holidays, and family events. Company parties brought up the rear at over 50 percent. An alcohol-induced blackout is when a person experiences partial or complete memory loss during a drinking episode. It’s usually associated with negative consequences, which can be serious and include injury or even death. Our respondents noted they were most likely to black out at holiday events with open bars (nearly 32 percent). Participants were the least likely to black out at family events (15 percent). Guests enjoyed themselves far more than hosts at open bar events, as nearly 91 percent said the gathering they attended was a good time. Hosts, on the other hand, only enjoyed themselves 44 percent of the time, while over half said they were neutral. Hosts of open bar events are the ones who are usually on the hook financially, which might temper their enjoyment a bit. If they’re not imbibing to excess, it also might not be enjoyable to watch guests behave in questionable ways. 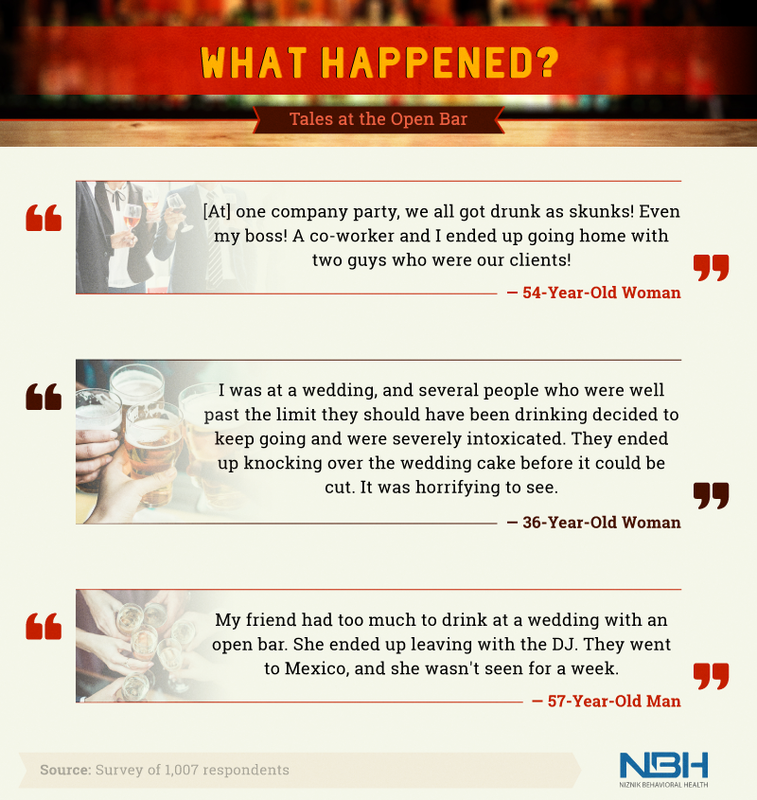 We also asked our respondents about experiences while attending an open bar event. For starters, some people used an open bar as a catalyst for sexual activity, with several reporting they went home with someone – or even left the country. Others reported deeds that weren’t sexual but were still embarrassing or traumatic, like guests who knocked over a wedding cake. After reading through our findings, you may question whether you’re going to have an open bar at your next event – or what your drinking behavior will be the next time you’re confronted with free alcohol. As our survey found, many people do drink more than normally at open bars and may engage in questionable behaviors, so you might want to think twice before ordering more than one drink at the next company party. Overall some people choose to an occasional drink to destress, socialize, or celebrate, but if you notice a friend or loved one struggling with their drinking habits, it’s time to seek help. Talk to our team and learn how Niznik Behavioral Health provides substance abuse treatment of the highest quality. There were 1,365 respondents from Amazon’s Mechanical Turk. However, 358 did not meet the qualifications to participate in this study, leaving 1,007 able participants. The respondents who were excluded stated they do not consume alcoholic beverages, didn’t attend an open bar in the past year, or missed the attention-check question. Throughout the survey, any outliers were excluded from our data. From the able respondents, 47 percent were women, and 53 percent were men. Our respondents ranged in age from 18 to 78 with a mean of 34 and a standard deviation of 11.2. The data we are presenting rely on self-reporting. There are many issues with self-reported data. These issues include but are not limited to selective memory, telescoping, attribution, and exaggeration when it comes to alcohol consumption and personal finances. As a result, the outliers in this study have been excluded. If you’re planning an open bar at your next event, you might want to think twice. If you want to share our findings for noncommercial purposes, please do – but don’t go overboard and forget to link back here to provide our team credit for their work.